Bassersdorf, Switzerland: – Rotronic, one of the world’s leading measurement solutions specialists, is helping many Swiss pharmacies comply with the country’s demanding temperature-controlled medicines storage regulations. Pharmacies throughout Switzerland are subject to the strict HMG Therapeutic Products Act, which prescribes at which temperatures certain medications must be stored. To meet these requirements, the temperatures in the refrigerated medicine cabinets must be checked and documented regularly. With its ultramodern loggers, the Rotronic Monitoring System (RMS) reliably measures the temperature in pharmaceutical warehouses and sounds an alarm via software if defined limit values are exceeded. A leading Swiss pharmacy chain pharmacieplus AG recently suffered damage to expensive stock following a high temperature excursion within a particular pharmacy store. As a result, the company has adopted Rotronic’s user-friendly RMS monitoring system to save time and money. A key criterion for ISO 9001-certified pharmacieplus was that security of patient data must be assured, along with an audit trail extending up to ten years, allowing all data to be requested and inspected during annual checks by Cantonal pharmaceutical inspectors. At pharmacieplus, the monitoring system is operated by Rotronic data loggers, which communicate with the software using an 868 MHz wireless connection via gateways or directly via LAN connection. Rotronic data loggers are positioned in the corresponding rooms and are set so that they record the temperatures – depending on requirements – every 10 seconds up to every 15 minutes. Most of the devices are used in refrigerators, as medicines stored there are particularly sensitive to temperature fluctuations. In the central warehouse and headquarters in Bremblens, in the canton of Vaud, it was decided to collect and record humidity as well as the temperature. The mini logger sends the data via radio to a gateway, which transmits them via Ethernet to the server. The gateway must be installed at a point in the branch where the wireless connections to all data loggers are ideal. The data are transmitted to a server to be stored centrally. The alarm ensures that a warning message is triggered immediately if the temperature rises or falls. This can be set individually in each branch. The greatest challenge lay in maintaining data privacy and high information security, making data center and server environment configuration more complex. In addition, it was necessary to create a joint design and implementation team involving experts from pharmacieplus and Rotronic, working largely by teleconference. 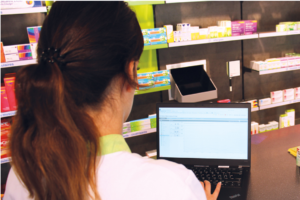 For pharmacieplus, Sylvie Hug was responsible for IT support, configuring the hardware at all locations, and training employees, working in close cooperation with Rotronic Sales manager Marcel Rohrbach and Service manager Ayman Nagy. After setting up the software on one of the hosting company’s servers in Geneva, the first operational RMS monitoring system was installed at Bremblens (VD) by remote engineering in cooperation with Rotronic. After successful commissioning, the other pharmacieplus sites were able to access this application directly, after installing the necessary infrastructure. During 2018, the Rotronic system was introduced to almost half of all pharmacieplus outlets. Within weeks, local users had become enthusiastic about the simplicity of system handling and saw the added value of automatic temperature monitoring and individually configurable alarms. The data are now recorded reliably and accurately every minute and can be viewed at any time over various periods of time. This saves time and simplifies control over compliance with temperature regulations. Ms. Hug says the system has met all key objectives for pharmacieplus. “The Rotronic RMS has proved very stable and user-friendly,” she commented. “Many of our pharmacists were somewhat skeptical initially but are thrilled today” Ms. Hug added. The pharmacy chain has since rolled out a campaign that enables local pharmacists to purchase the system on preferential terms, also receiving support with installation. Founded in 1965, Rotronic AG has become one of the world’s leading names in humidity and temperature measurement and is renowned for the high quality of its Swiss-made meters, instrumentation, sensors, data loggers and other measuring equipment. As the leading brand for Process Sensing Technologies, Rotronic specialist measuring solutions are in daily use worldwide in pharmaceutical, chemical, foodstuffs and many other industrial sectors. Rotronic’s lines of business include products for measuring humidity, temperature, CO2 and differential pressure. As a leader in the field of humidity and temperature measurement, Rotronic is also increasingly making a name for itself as a world leader in the measurement of other parameters including low dew point, CO2, differential pressure, process pressure and airflow. Rotronic is a company of the PST Group (Process Sensing Technologies), whose customers benefit from a wider product range and international distribution network. Click on Pharmacieplus case study for more information. Pharmacieplus stores across Switzerland are able to securely connect to central Rotronic RMS software for remote storage temperature monitoring and alerts.